Once upon a time, there was a princess named Edith and a prince named Harold. They were married in 1895 and that was the beginning of an unhappy tale. Edith was from the kingdom of Rockefeller, the daughter of oil king John D.
Harold sprang from the McCormick empire, his father, Cyrus, had devised a thing called the reaper. How much Harold brought into their palace isn’t known, but it didn’t really matter: John D. made sure his daughter had all the comforts of home by sending along $40 million for a wedding gift. After ruling the Chicago social world for nearly 17 years and supporting the opera with gifts in the millions, the couple moved to Lake Forest to settle in a cozy $5,000,000 castle nestled on 200 acres overlooking Lake Michigan. For the most of that first year their house guests at Villa Turicum ranged from real royalty to big names in many fields, sometimes both at the same time. Fifteen bathrooms and 44 rooms were more than enough to take care of any home entertaining. To while away the time there was a lake front swimming pool, stables and bridle path, vast gardens in which to stroll, or a high stone pavilion to sip tea. But, alas, this was not a fairy tale and how was love to survive in such surroundings? ne pavilion to sip tea. Perhaps it could have, but for Edith's "vibrations." She once called off a luncheon for 200 guests at the last minute without notice. Another time, she paid an 80 per cent duty on an imported $1,500,000 emerald necklace, wore it once to a small party, and then tucked it away for good. 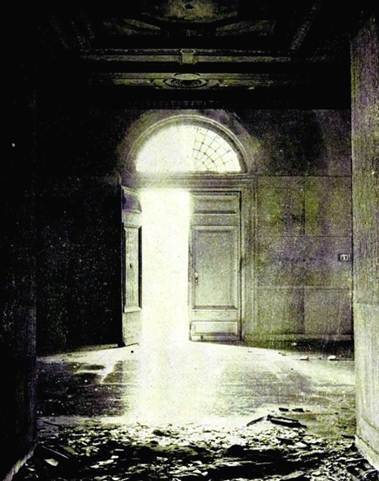 Entering a sanitarium with a nervous disorder later that year (1913) Edith met Freudian psychoanalyst Carl Jung. She considered his treatments so beneficial she followed him to Zurich, Switzerland, where for eight years she was his pupil and assistant. It was also there she developed a theory she was the reincarnation of the young bride of King Tutankhamen of ancient Egypt. This was probably too much for Harold, for when she returned they separated and eventually were divorced. Harold then married Polish opera singer Ganna Walska. This was believed to have been a blow to Edith, but never giving up the ship she always kept a room ready for her former husband at her enormous Chicago mansion. Harold, in turn, always sent her a rose on her birthday. She died as she had lived; among valuable relics in plush surroundings. But her fortune had dwindled. At her death she had assets of $1,500,000 and debts of about $3,000,000. She was set aside in a glass-covered coffin in a crypt in Graceland Cemetery and was buried in a family plot in 1953, and - according to a caretaker - still well preserved under the glass. Her lone mourner at the burial was believed to have been a son, Fowler, who then disappeared to Europe. Harold, who had died in California, was buried in a plot across the lagoon from Edith. But while she lived, Edith Rockefeller McCormick also had a vision which perhaps could have become a reality. With two business partners, she bought an 1,800-acre tract of swampland north of Winthrop Harbor with plans to convert it to an Atlantic City of the Midwest resort area. But after sinking a million dollars into the Edithton Beach project she died and five years later a Chicago bank acting for the bond holders picked up the property for a mere $187,000. In 1947, the land was subdivided into Carol Beach Estates. Villa Turicum, fashioned after an Italian Catholic cardinal's 100-room summer villa, faded into disuse among weeds. Back taxes accumulated and in the 1940's, a group of investors bought the place intending to subdivide but lost heavily when plans fell through. The conventional modes of employing great wealth have not appealed to Edith, daughter of John D. Rockefeller, onetime wife of Harold Fowler McCormick, lion huntress, psychoanalyst, philanthropist, social arbiter. Her method of using her money was to incorporate herself. In 1923 she organized the Edith Rockefeller McCormick Trust, capitalized with a five-million-dollar contribution from her and $1,500 apiece from Chicago realtors Edwin D. Krenn and Edward A. Dato. Last week the E. R. M. Trust announced a new financing of eleven million dollars in five year 6% gold notes, "unconditionally guaranteed as to payment of principal and interest by Edith Rockefeller McCormick." The notes are secured by Edith Rockefeller McCormick's holdings in Standard Oil Companies of New Jersey, New York, Indiana, Ohio, California; Union Tank Car Co., Vacuum Oil Co., Atlantic Refining Co., Illinois Pipe Line Co., Continental Oil Co., Columbia Gas and Electric Corp. Proceeds of the issue will be applied to the operation and expansion of the Trust's real estate, which is mostly in north side Chicago property. The Trust has developed many a Chicago subdivision, has bought up many a Gold Coast home and erected apartment buildings on the sites. Thus all U. S. citizens with $1,000 or multiples thereof have the opportunity to make a conservative short-term investment with no tremendous yield but with almost governmental safety. AS A CONTRAST to the article opening the home page, I believe the following piece written by Will Leonard in 1966 serves to embellish the collection of photos presented here. It is also a more accurate recollection of events than the story told in “The Tale of an Unhappy Kingdom,” which now appears in the column at left. This is Villa Turicum during the 1950s. It sat “mothballed” for many years, as any potential buyers - or one development plan after another, fell through. THEY USED TO SAY that a person looking out the east windows at Villa Turicum might expect to be looking across Lake Como, rather than Lake Michigan. Unfortunately, the view is all that is left of the lavish estate that was regarded authoritatively as the finest example in America of Italian landscape design. Villa Turicum was the seldom-used Lake Forest country house of Edith Rockefeller McCormick. It consisted of 44 rooms and 15 baths, and it was set amid 300 acres densely wooded with ancient oak, ash, and maple trees, all of which were minutely cataloged. The estate was garnished with magnificent formal and informal gardens, bowling greens, a stone pavilion for sipping tea or listening to musicians, a polo field, stable and bridle paths, a swimming pool by the lake shore at the foot of the bluff, and reflecting pools amid the gardens. 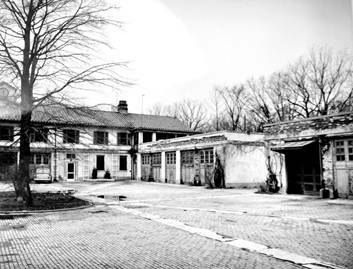 The service area included 21 garages, and sleeping quarters for the personal servants of visiting guests. 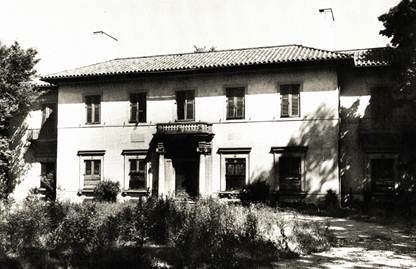 Villa Turicum at the end in 1956, when it was ordered razed. The scars of vandalism are evident; doors and windows were open to the weather, and the once beautiful approach mall was by then an overgrown weed patch. The approach to the west entrance of the Italianate residence, of stucco on solid brick, was a formally landscaped mall, 500 feet long and 100 feet wide. The regal mansion had huge marble fireplaces, a marble-walled ballroom, a Pompeian room with fountain and oil painted walls and ceiling, a walnut paneled main dining room which could accommodate 60 guests, 13 master bedrooms, each with bath and fireplace, and 14 servants’ rooms, besides numerous other rooms and areas. THE GRAND HALL - Sunlight and debris violate the west entrance hall, once formal and flawless. THE GALLERY - The view down the central gallery toward the west entrance hall; shattered French doors to the Pompeian Room on the left, and an outdoor courtyard on the right. Edith Rockefeller McCormick lived like a queen all her life, grandly and dignifiedly (and just a little eccentrically). But not with great happiness, despite her fantastic wealth. Her end was tragic, and the fate of Villa Turicum is similar to her own. The daughter of John D. Rockefeller, America’s most famous millionaire of the 19th century, Edith was born in 1872. She was educated by private tutors and taught to believe that democracy was a word that didn’t apply to aristocrats like her. In 1895 she was married to Harold F. McCormick, son of another of America’s biggest multimillionaires, Cyrus McCormick, inventor of the reaper. The world could only guess how much the newlyweds were worth, but it heard old John D. had given his daughter a 40-million dollar dowry. 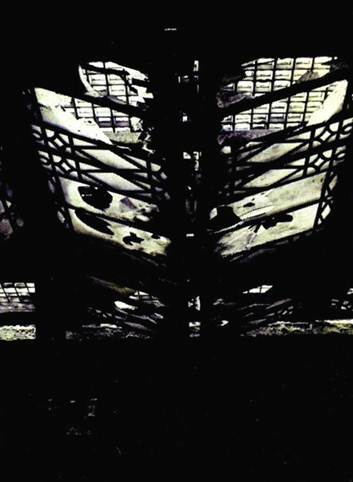 THE POMPEIAN ROOM – Glass panels of the skylight shattered. The McCormicks lived their first two years together in Council Bluffs, where Harold was western agent for his family’s interests, and in later years Edith talked consistently as if those two year as a young bride in Iowa were the happiest of her life. They came to Chicago in 1897 and bought for their residence the great mansion that had been built at the northwest corner of Oak street and Lake Shore drive in the 1880s by Nathaniel Jones, of the Chicago Board of Trade. Mrs. Potter Palmer was the queen of society then, and the young Mrs. McCormick did not challenge her for the position, but she and her finial, personable husband nevertheless became social leaders instantly. 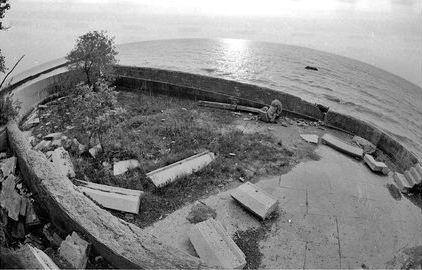 THE BATHHOUSE/CHANGING ROOMS – Located at the base of the bluff beside the swimming pool, within there once was an elevator to the house should guests choose not to climb the stairs. 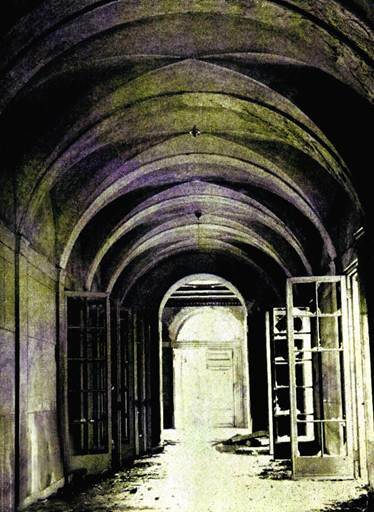 The interior of the bath house/changing rooms after the mansion had been destroyed on the bluff above, and the elevator shaft filled with rubble. This is the tunnel that once led to the elevator. John Rockefeller McCormick was born to them the year they came to Chicago, and the young mother, who walked thru life with great pride, was especially proud of this scion uniting the blood of two celebrated families. Less than four years later, however, her son was dead. This first great tragedy in her life affected her so deeply that it generally was believed that the eccentricities of her later years might have stemmed, in part, from the shock of little John’s death. There were three other children, a son, Fowler, and two daughters, Muriel and Mathilde. Edith and her husband spent 2 million dollars for the 300 acres at Lake Forest, and 5 million dollars more to build the beautiful Villa Turicum, designed for them by Charles A. Platt. It was finished in 1912. However, in the next year Mrs. McCormick’s personal problems multiplied, and she saw comparatively little of Villa Turicum. Finally in 1913, she was under great nervous strain and went to Switzerland to be treated by and to study under Dr. Carl Jung, the famed associate of Dr. Sigmund Freud. It was heard, back in Chicago, that she had fallen under the spell of a “synthetic psychologist” who was working to cure her of “complexes.” The psychiatrist was an unknown in American circles in those days. 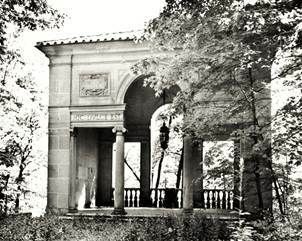 THE TEAHOUSE/MUSIC PAVILION – “Here there is sweetness and quiet” reads the carved Latin inscription across the front of this open pavilion where the McCormicks served tea and otherwise entertained guests a century ago. Walls of a kitchen and a musicians room beneath the tea house were defaced by vandals but the building was perhaps the most structurally sound of those remaining on the estate. Harold McCormick did not hold with psychoanalysis, and he and Edith, after long discussion in Zurich, agreed to a separation in 1918. By that time, Mrs. McCormick had become a good friend of Edward Krenn, a dapper little Swiss who was a staunch disciple of Doctor Jung. When she returned to Chicago in September, 1921, Krenn came with her. Three months later she filed for a divorce, and it was granted in a matter of minutes. Her intimates sensed that Edith was hurt when Harold subsequently married Ganna Walska, a Polish singer who was an opera diva, but not a very good one. A romantic story told that for the rest of her life Harold sent his first wife one perfect red rose every year on her birthday. Edith Rockefeller set up Krenn with Edward Dato in the real estate firm of Krenn & Dato, which developed great section of Chicago’s north side. Krenn became her constant companion, and the town used to enjoy the sight of them driving up in a chauffeur driven limousine to a 10-cent movie in the Loop. Once Edith had created a tempest in a tureen when she called off a dinner party for 200 guests at Villa Turicum at the last minute, without a word of explanation. Now other eccentricities appeared. She paid 80 per cent duty on an imported emerald necklace costing a million and a half dollars, wore it once to a small party, and never wore it again. She shocked a dinner party by announcing that she knew she was the reincarnation of the young bride of King Tutankhamen of ancient Egypt, whose tomb was being explored with great publicity at the time. THE MARBLE SWIMMING POOL - It would ultimately succumb to erosion & the waters of Lake Michigan. She was extremely fearful of travel by train. Her trip to Europe and return had been an agony. Now she seldom did any kind of traveling, beyond automobile trips to nearby towns. And she seldom went near Villa Turicum, never stayed overnight or had a meal there after her return from Europe, although a full staff was there to keep it in pristine condition. With her partners, she bought an 1,800 acre tract of swampland north of Winthrop Harbor on Lake Michigan and announced plans to convert it into the Atlantic City of the middle west. It would be called Edithon beach. She spent a million dollars fruitlessly, and five years after her death in 1932 a Chicago bank, acting for the bondholders, picked up the property for a mere $187,000. After the war the land was subdivided for housing developments. With the stock market crash of 1929, and the depression, Edith Rockefeller McCormick’s and Krenn & Dato’s real estate investments crashed too. She moved from her town mansion at 1000 Lake Shore drive to a suite in the Drake hotel. There was a last minute reconciliation with her daughters before she died on Aug. 25, 1932. At her death, John D. Rockefeller’s daughter was broke. She left assets of a million and a half dollars, debts of 3 million. 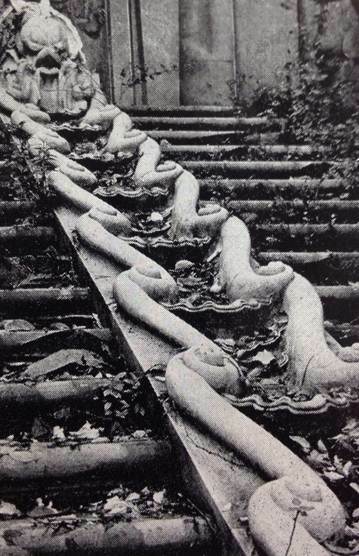 THE WATERCOURSE - Over time, the graceful marble cascade and stairs to the bathhouse would come to lie in ruins. The estate of Edith Rockefeller McCormick was no easy matter to settle. It took 19 years, in fact, and even after all that time, creditors got barely more than 50 cents on the dollar. Early in 1934 Edith McCormick’s personal property was auctioned, and the world got its first revealing look at what up to then had been legend. 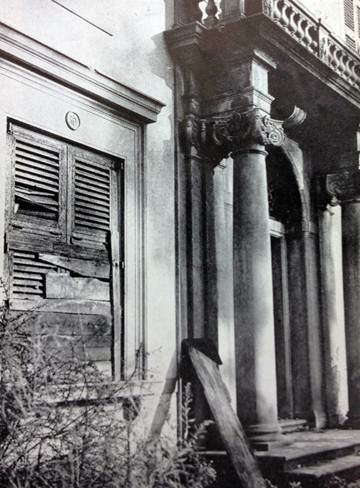 A DOOR NO MORE - Still grand despite the vandalism and neglect - Villa Turicum’s boarded up main entrance in 1955. The long-time superintendent of Villa Turicum winced as he watched prospective buyers trample over the shrubbery and gardens of the estate when it was opened for an auction preview. More than 15,000 persons visited the house – most out of idle curiosity – and autos were jammed all over the approach mall. Seven shoppers reportedly were pushed into the pool in the Pompeian room as the swarm of visitors surged thru the mansion. The attendance was so large that it was decided to charge an admission at the sale. Several days later, the property went on the block. Though the crowd was smaller, the proceedings still were of little comfort to the retinue of servants which had kept Villa Turicum a sanctuary of beauty and wealth removed from the crush of the crowd. Furnishings that had been imported from Europe, many of which the family as well as shrewd collectors regarded as priceless, were sold for about 2 cents on the dollar. Gilded bishops’ thrones of the Italian Renaissance brought about $150.00 each, and when the auction was over, the art objects and furnishings that had originally cost 3 million dollars were carried off for a total price of $25,000. PALATIAL GARAGE – Larger than the Villa Turicum mansion itself, this quadrangle housed servants of both the McCormicks and their guests. Put into use in 1912 when cars were still in limited number, the building contained 21 garages each with copper doors facing onto a brick-paved courtyard. In the last few years of the estate, the quarters above the garages were rented to a few persons working in Lake Forest. Some of the original acreage at Villa Turicum was sold to pay the mounting tax bills. The staff, which now included only a handful of caretakers, confined its activity to a bare minimum of maintenance until a buyer could be found. Unfortunately, buyers of country estates did not abound in the depression, and it was not until 1947 that a group of purchasers was found, again at an auction. A syndicate bought the estate for a mere $77,000 plus a $160,000 tax lien. There was talk at the time of turning Villa Turicum into a private club, but that didn’t prove feasible. In the early 1950s the mansion was offered to the community of Lake Forest, but the offer wasn’t accepted. By this time, it was evident that the days of the villa were numbered. Trespassers came in increasing number. Windows were broken, statues overturned, and granite walls and outbuildings were defaced with childish scribbling. And though the mansion was boarded up, the weather found openings that it relentlessly exploited. THE LILY POND lies hidden among the underbrush on the estate. 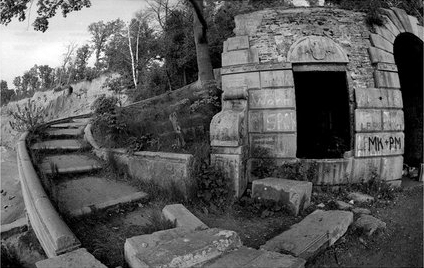 At the time this picture was taken the pool was still in good condition, but statues buried in the trees on the far side had been beheaded by vandals. Finally, in 1956, Robert Kendler, president of Community Builders, Inc., purchased what was left of the country estate, for approximately $150,000. In addition, he had to settle the matter of back taxes and penalties, which, by the next year, amounted to $600,000. Now Kendler’s men are cleaning out the wreckage of the gardens and service areas and are building modern houses on sites ranging from one to three acres. Some of the remnants of the old mansion –patio brick, for instance – are being incorporated into the new homes. But most of the evidence of the earlier days of opulence is gone. One trace of Edith Rockefeller McCormick’s days of glory, however, remains. Kendler has named his real estate development Villa Turicum. In 1956, present owner Robert Kendler, president of Community Builders Inc., Skokie, purchased the property and held on to it a year later in a delinquent property tax action. What had cost $5,000,000 to build in 1912 was termed a dangerous building in 1956 and was ordered torn down. The mansion, razed three years ago, had been ravaged by vandals since it fell into disuse. The vandals came from all over to take a whack at valuable marble floors, teak-paneled walls in the house and heavy stone statues and fountains about the grounds. They left their names and initials scrawled everywhere. There is virtually nothing left to destroy, but still the curiosity seekers converge on the property, lured by rumors of excitement and intrigue of a haunted house at night. Those caught have been arrested and fined. Consequently, carved stone fountains which cascaded water down terraces leading to the pool below the bluff have been chipped, pried loose and hammered to a point beyond repair. However, the trespassing should come to an end shortly when Kendler builds his new home on the bluff just south of where the mansion stood. To provide easier access, half the remaining quadrangle of servant quarters and garages will be torn down for an extension of Circle Lane. The tile - roofed quadrangle, fashioned after the villa, borders Westleigh Road and is in itself a fine example of Italian architecture. The servant’s quarters were located on the second floor at either end of the structure. The ground level facing into a brick - paved courtyard contains 21 garages, each with weathered copper doors. Each garage had pipes to carry water for washing cars. Also still standing, east of the quadrangle, is a walled garden with high arching gates at each end. Where once was held some of the finest flower shows on the North Shore, weeds now thrive. 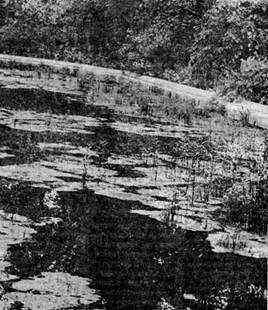 A huge stone lily pond on the south side of the estate is still intact but lies hidden by high shrubs and filled with green scum. The lake front swimming pool conceivably could be cleaned out and used once more. 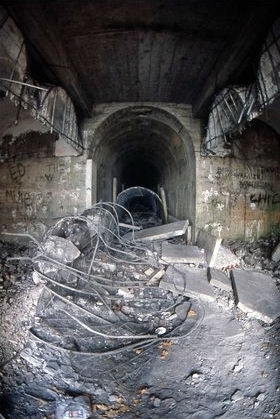 A tunnel adjacent to the pool is littered with rubble. 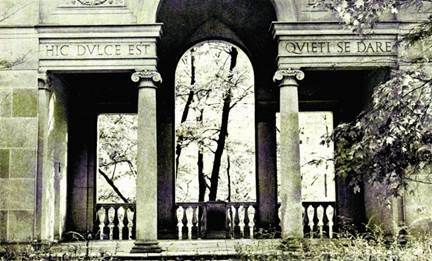 Its arching walls are lined with names and initials which trail off into the darkness where once an elevator hoisted guests to the mansion on the bluff above. The elevator is still in the shaft which was filled in with dirt a few years ago. In 1912 the cost of building Villa Turicum was great; today it would be astronomical. Edith McCormick's life was a generous - if not odd - one, but money never brought happiness. Her weird vibrations also had estranged her two daughters. Another son, John, died in infancy of an infectious disease. The heirs to her legacy were the tax collectors, the vandals and a few who remember "once upon a time." The McCormick mansion at 1000 Lake Shore Drive in Chicago has long been torn down and Villa Turicum will soon be just a subdivision where only traces of a once-great dynasty will be occasionally uncovered by a bulldozer. It‘s very difficult to put articles together today for the website ~ it’s a rainy August morning in Chicago. This contributes to my blue funk when I look at some of my photographs; call it pangs of misfortune for the Villa and its history. What is also poignant is that I just found an article that was published in the Waukeegan News-Sun on Saturday, September 21, 1963. I was born the previous Sunday, September 15, 1963.